Despite its powerful cataloging tools and easy-to-use editing features, many users are still nervous about committing their photo library to iPhoto. The program’s approach to storing images feels a little like the photography version of Hotel California: your pictures check-in, but they can never leave. 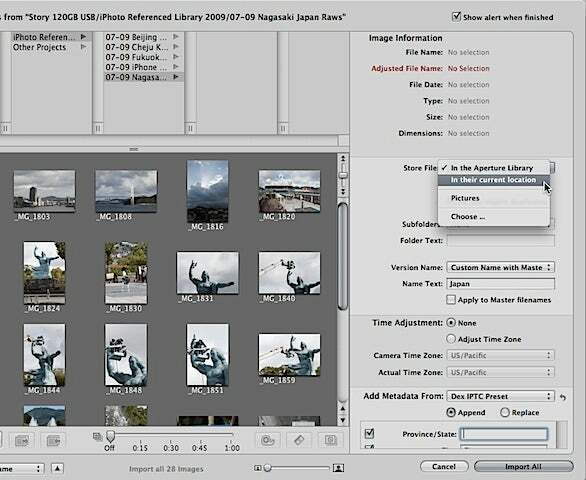 That may be fine if you don’t often venture beyond iPhoto’s borders; but what if you want to take advantage of the advanced image-adjustment tools in programs such as Aperture or Lightrooom? The good news is you can enjoy the benefits of iPhoto and have some flexibility, too. The secret is to create a referenced library. This means that instead of importing all of your master images into iPhoto, you simply “point” iPhoto to where those originals live—whether on your Mac or on a separate hard drive. The referenced-library approach is very flexible and perfectly suited for Raw shooters who have to manage large files. Here’s how you set it up. Although not mandatory, I recommend you also give yourself a clean slate in iPhoto by creating a new iPhoto Library file. Mixing referenced shots with those stored within iPhoto can lead to problems: at some point you’ll become confused by what lives where. Your iPhoto library is really just a database that tracks of all your pictures and the information that accompanies them. When you edit a photo in iPhoto, the program doesn’t actually change the original image file at all. Instead, it makes note of your settings and then generates a high quality Jpeg that represents those edits. This is your working copy. This approach means that you can go back and adjust the settings at any time without degrading your original image. Every time you do this, iPhoto generates a fresh working copy based on the changes you’ve made. When you choose to export the photo—to e-mail it to someone else, for example—iPhoto then applies the changes you’ve made and generates a new jpg, still leaving the original file untouched. You can create as many iPhoto libraries as you'd like. To switch between them, hold down the Option key as you launch iPhoto. Turn off the Copy Items To The iPhoto Library option. You should now have an empty iPhoto library ready to fill with photos. 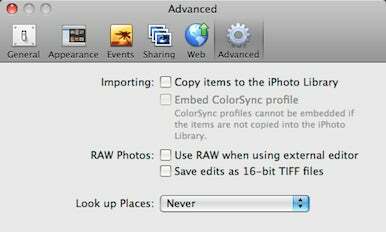 To switch iPhoto to referenced-library mode, choose Preferences from the iPhoto menu, select the Advanced tab, and uncheck the box next to the Copy Items To The iPhoto Library option. This tells iPhoto to reference imported images instead of copying them. To use iPhoto with a referenced library, you’ll need to learn some new habits—specifically, how you transfer photos from your camera. Typically, iPhoto will pop up when you plug in your camera and offer to import photos for you. Don’t accept its offer. iPhoto will ignore your stated preference and will instead copy the new images to its database. 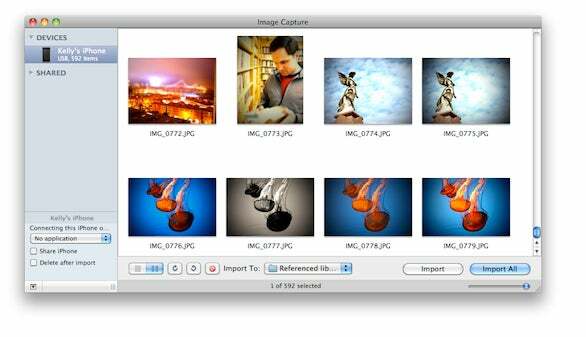 Use Image Capture to move photos from your camera to your folder of referenced photos. I recommend that you create a new folder on the hard drive for each shoot you download. This lets you keep things organized. Label the folders so you can tell at a glance what’s in each of them. I use a month/year format with short descriptive name, such as “10-09 NY Street Shoot.” As a bonus, when your import these labeled folders of images into iPhoto, it will use the folder names to describe each Event, so iPhoto and the folders on your master hard drive will be in sync. 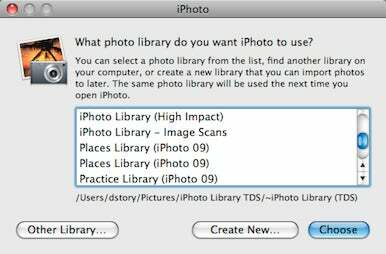 To import photos from your hard drive to iPhoto, choose File -> Import To Library. The process will appear the same as always, with one important exception: instead of copying the original file to the iPhoto Library database, iPhoto will create an alias for each photo. The result is a much slimmer library—rather than storing a 20MB Raw file, is only storing a 4kb alias. Because iPhoto creates thumbnails of every referenced file you add to your library, you can still view smaller low resolution versions of your pictures in iPhoto even if the hard drive with all of your images isn’t connected. This is helpful if you’re a laptop owner and want to see the photos in your iPhoto library even when you’re away from your external hard drive full of masters. In fact, you can add descriptions, change titles, even organize albums—all with the master drive disconnected. What you can’t do is edit the pictures. If you want to adjust exposure or color temperature, iPhoto will warn you that the master file can’t be located, and ask you if you want to find it. All you have to do is connect your hard drive of masters, and you can edit to your heart’s content. You can work with your iPhoto library even when your master library is disconnected. If you try to edit an image, iPhoto will prompt you to reconnect your hard drive. Another benefit of this approach is that you can point Aperture or Lightroom to this same hard drive of photos. In Aperture, just make sure that you choose Store Files In Their Current Location from the Import menu. In Lightroom, choose File -> Import Photos From Disk, then choose Add Photos To Catalog Without Moving. Aperture can also access your referenced files. If you want, you can have all three applications open at once and working off the same set of masters. The metadata you create (ratings, keywords, etc.) will be stored within each application. So if you give an image a three-star rating in iPhoto, but give it four stars in Lightroom, it’ll retain the different ratings in each program. Keep in mind that you’ll need to back up your masters so your photos are protected against hard drive crash. You should back up your iPhoto library, too, since it represents any work you’ve done to your photos, including applying rating, tags, faces and more.